Orange Crinkle Square Neck Maxi Dress is rated 3.5 out of 5 by 2. The Crinkle Square-Neck Maxi Dress is the perfect addition to your summer wardrobe. 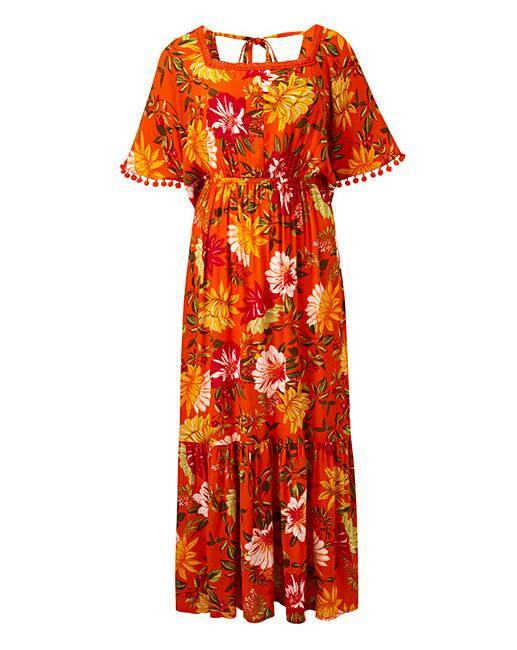 Adorned in a warm, summery orange floral print this gorgeous maxi dress features a square neck and tie back detailing. Made from a lightweight breathable crinkle fabric, this dress also features a gathered waistband clinching the waist, accentuating your curves and creating the illusion of the perfect hourglass figure. Rated 2 out of 5 by Jen from Way too big Bought this in advance of the summer but was so disappointed...it was way too big all over and the square neckline was mis shaped. Rated 5 out of 5 by Susanmcc from Gorgeous colour Bought this for a posh christening. Makes me feel lovely and looking forward to the day with a brilliantly bright maxi dress.